This “new” mind-set has spawned a “new” gospel that is flourishing. Mega churches are being grown from this gospel in virtually every major city in America and other nations as well. Pastors are the CEO’s of these churches that are being managed like corporations. Deceitful workers are transforming themselves into the apostles of Christ who glory in their flesh, their growth, their numbers, and their influence, while deceiving so many others. These men boast of their new gospel and methods of reaching people while daring to criticize the old-fashioned gospel as being out of date and out of style and not meeting today’s needs. The new preachers of this new gospel preach love, but it’s a love that never rebukes, corrects, or trains. They mention the name of Jesus, but it’s another Jesus that they have formed in their own image according to the godless pop culture around them. They talk about a loving heavenly Father, but know nothing of God being an All Consuming Fire. While emphasizing the goodness of God they completely avoid warnings of His severity (Rom 11:22). If a man is ambitious, has strong leadership skills, a warming charismatic personality, and he knows how to employ the right formula and new methods, he can grow a church almost overnight, especially by preaching a non-confronting, non-convicting gospel and giving people what their itching ears want to hear. At the core of these new preachers’ ambition, however, is an insatiable desire for an honored reputation and an unsanctified drive for quick growth and quick results that would give them greater power and influence. Men find great fulfillment in significance so any hook with the bait of power and success dangling from it is an easy temptation. Yet we must realize that some of the greatest failures by human standards are God’s greatest successes. God’s measuring gauge and standard of success is so different than man’s. SUCCESS IN MAN’S EYES OR GOD’S EYES? Noah would be the classic example of a great failure today. His message and ministry spanned 120 years, but produced no converts outside of his own family. He was an excellent carpenter and ship builder, but as a preacher he failed and didn’t get the job done. No numbers, no following, and no influence. The gospel he preached and the methods he used produced nothing. But the Bible speaks of him in lofty terms calling him a preacher of righteousness (2 Pet 2:5), obedient (Gen 6:22, 7:5), and perfect (blameless, having integrity). What would you rather have written on your tombstone – the accolades of men that were lies, or the testimony of God that remains forever true? What do you want your epitaph to say? Do you want to be honored by earth or by heaven? How do you want to be remembered? Where did we get the idea that if the size of churches and ministries are not numerically large, do not grow fast, or do not grow at all, and do not meet man’s approval they are automatically counted as failures? From whence comes this persuasion? By using the right formula and Madison Avenue tactics almost anyone can draw a crowd and build a church today. Add to that, an entertainment, socially-adapted, fun-based “gospel” message and people will come. Then word will spread and more people will come. How many people do you think would remain in that church if the pastor changed his philosophy and suddenly began preaching a strong anti-sin, anti-worldliness, cross-bearing, Jesus exalting repentance message? I’ll tell you exactly what would happen. It would cause a church split. Some would be offended and leave. Others would be convicted and repent. But what would we rather have: 1000 false converts or 100 true ones? The way you win people is the way you keep them. If you win them with entertainment you’re going to have to entertain them to keep them. If you win them with a soft gospel you’re going to have to continue to feed them a soft gospel to keep them. Falsehood, half-truths, and compromise will beget more of the same. 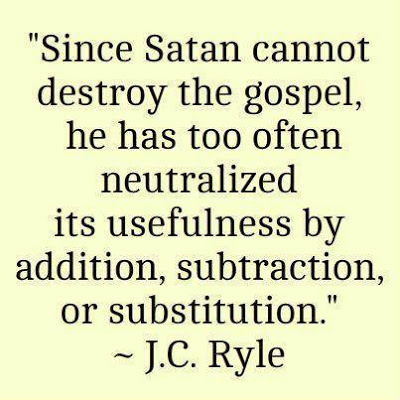 A defective gospel produces defective converts. I heard a television preacher say that in one mega church he spoke at he discovered that 60 couples were living together out of wedlock. Not one of them was legally married. The reason given: None of them thought it was wrong. How shocking! Here’s the question I have: What kind of message were the pastors of that church preaching? Obviously a very defective one. The fruit of a false gospel is false converts. Faith without works is always dead. The Church today is full of false converts who have never been searched out and convicted of their sins. They come to church meetings, they sing church songs, they talk the church language, and hear church sermons, but they live like the world. Their lifestyles are in contradiction to the Word of God. One man said, “I know I shouldn’t be shacking up with my girlfriend, but I believe in Jesus and He knows my heart.” The Bible says that the demons also believe and tremble (Jam 2:19). In other words, the demons believe and fear God more than those like this man who say they believe, but have no works or corresponding lifestyle to prove their faith (that is the context of Jam 2:14-18). When you leave certain components of the cross out of the gospel you open a large door for the sinner and the half-hearted seeker to feel comfortable in their sins and in their worldly lifestyle. And when that becomes the norm or status quo in a church, deception spreads like a cancer. A false or an incomplete gospel establishes an atmosphere of deception. People are being errantly taught that all you need to do to be saved is to acknowledge your belief in Jesus, pray a little prayer, and you’re in. Nothing is ever said before or after salvation about true heart-repentance, surrendering your life – losing it to gain it, following Jesus in whole-hearted obedience, and loving Him above all others.